The Fibrex® Catheter Patency Device is a revolutionary development in re-establishing patency of non-functioning central venous catheters. Fibrex® offers an efficient, minimally invasive method of mechanically disrupting fibrin formation from the interior and exterior of indwelling catheters, without the risks associated with femoral punctures, or sepsis related to catheter exchange. This State-of-the-Art device utilizes a tri-axial delivery system consisting of a delivery catheter, an inner guide structure, and a shaped memory, helical-formed, nitinol stripping coil actuated by an ergonomic deployment control handle. The Fibrex® Catheter Patency Device is manually inserted through the luer connector of a vascular access catheter, exiting via the distal lumen end-hole. The nitinol stripping coil deploys around the distal exterior of the central venous line. 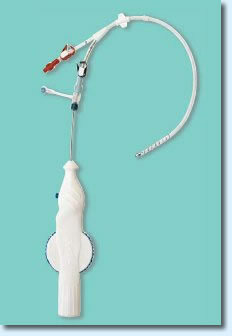 The coil is manually actuated to achieve a “corkscrew effect” thereby mechanically stripping the catheter of fibrinous film. Fibrex® is inserted through the dialysis catheter connector hub, eliminating the need for femoral punctures and avoiding the associated complications consistent with traditional fibrin sheath stripping. Fibrex® obviates the need for Catheter Exchange and eliminates associated patient trauma and potential complications related to sepsis.